Dewbauchee Vagner it is a new vehicle for GTA Online and GTA 5, added along with the addition of Independence Day Special. 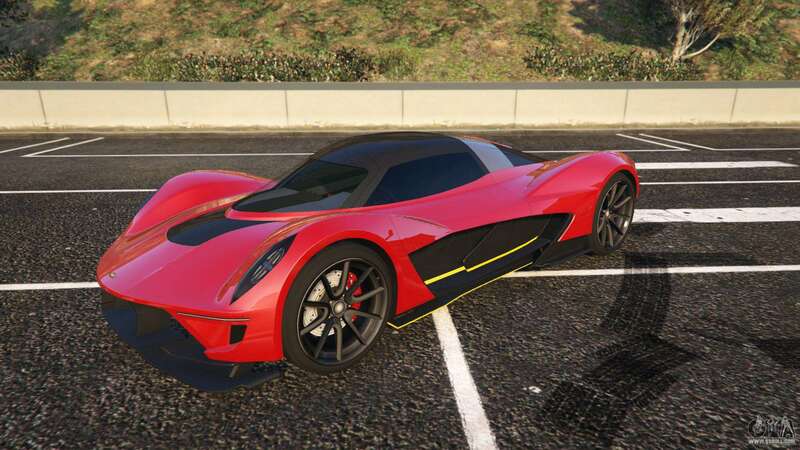 Dewbauchee Vagner this is a brand new hypercar for your favorite game. The machine is a prototype, but is a perfect work of automotive art. This is a real car of the future, perfect sports car, developing mind-blowing speed. The car is part of the complement Independence Day Special for GTA Online. Which, in turn, is a bonus to the recently released Gunrunning. The model is created based on the Aston Martin Valkyrie and is very similar to it externally, especially in the extended configuration. Separate body parts such as headlights and exhaust system were created based on similar vehicles such as the Jaguar C-X75, Porsche E Mission, Nio EP9 and the Bugatti Chiron. The case consists partly of carbon fiber, which greatly simplifies the design. The shape of the cockpit features a very elegant design. On the door side is a pretty aggressive angular elements, but the rest of the body is quite smooth and streamlined. If you talk about performance, the Dewbauchee Vagner is one of the fastest cars in the game. Moreover, it has excellent handling, so you will easily be able to subdue the power of the motor and guide her in the right direction. Suspension of the car low, which is undoubtedly good on smooth flat road. But riding on rough terrain can be a problem. The acceleration of the car though very effective but still inferior to such machines as Osiris and Tempesta. The machine will definitely become decoration of any collection and will cause envious glances of other drivers.